LeadiD closes $10 million Series B funding, changes name to Jornaya. The new brand reflect's Jornaya's success in driving digital enhanced customer acquisition outcomes via consumer journey insights. For more information, visit Jornaya. Jay Weintraub, Founder of LeadsCon, is launching Contact - a call marketing conference to be held in San Francisco on January 19 & 20, 2016. Contact.io is a premiere new conference for marketers who value calls. The two-day conference will help brands, advertisers and agencies navigate the next generation of mobile growth. If your marketing spend drives inbound calls or if you're interested in acquiring more calls and boosting results of your call center, then you shouldn't miss this event. Being on the conference Advisory Board allows us to help top brands/advertisers obtain a deep discount (and in some cases complementary) admission. Contact Jaimie Pickles for more information and to see if you qualify. 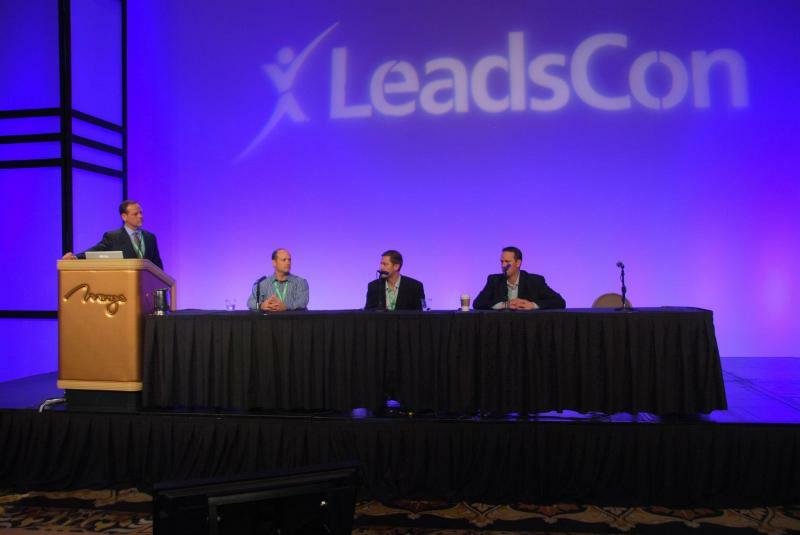 Jaimie Pickles moderated a panel session at LeadsCon West 2013 on Call Marketing Automation. Panelists included Keary Phillips (Allstate, Senior Program Manager - Digital Marketing & Lead Generation), Ryan Hartman (Esurance, Manager of Digital Marketing and Partner Revenue) and Jason Spievak (RingRevenue, CEO). ﻿LeadiD secures $1.7 million in funding led by Genecast Ventures. LeadiD closes $1.7 million in funding to accelerate the company's growth within the lead generation space. For more on this announcement, visit Genecast Ventures. Jaimie Pickles invests in LeadiD, an early stage company that certifies the origin and history of online leads. Mr. Pickles is also on the company's Advisory Board and helps develop business in the insurance vertical. For more infomation about the company and its solution, visit LeadiD.com. Mobile web advertising and applications are the new frontier in connecting buyers and sellers of all types of products - including auto, home, life and health insurance. This presentation explored the growth rate of smartphone device usage and the who, what & why of mobile web advertising, and which carriers have already started incorporating the techniques in their marketing mix. Case studies on Click-To-Call mobile web advertising were presented. Those interested in seeing the presentation can contact Jaimie Pickles. 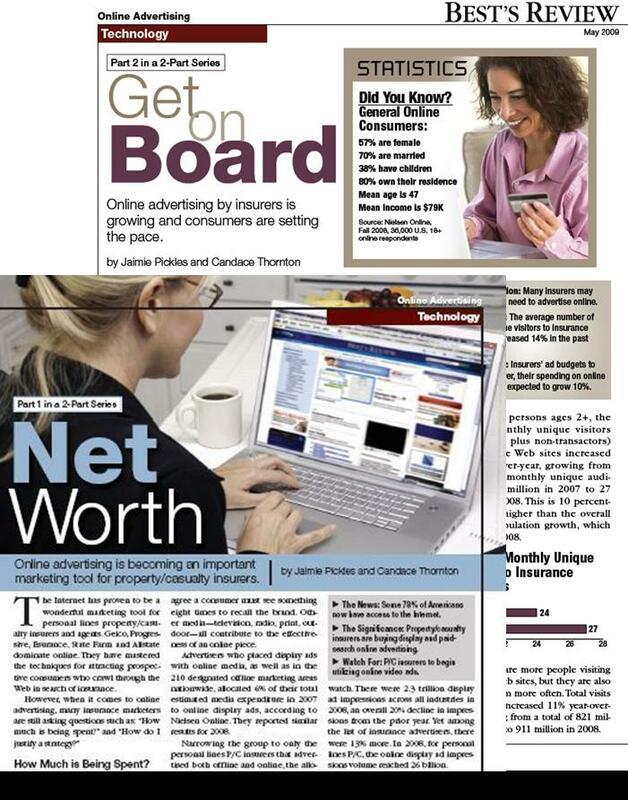 In 2009, insurance carriers spent nearly $600 million in online advertising. The year-over-year increase was 47%. This was an extraordinary result given year-over-year digital ad spending by all other industries was nearly flat. Further, insurer spending exceeded all other industries' in terms of the percent of total ad dollars allocated to online display advertising. 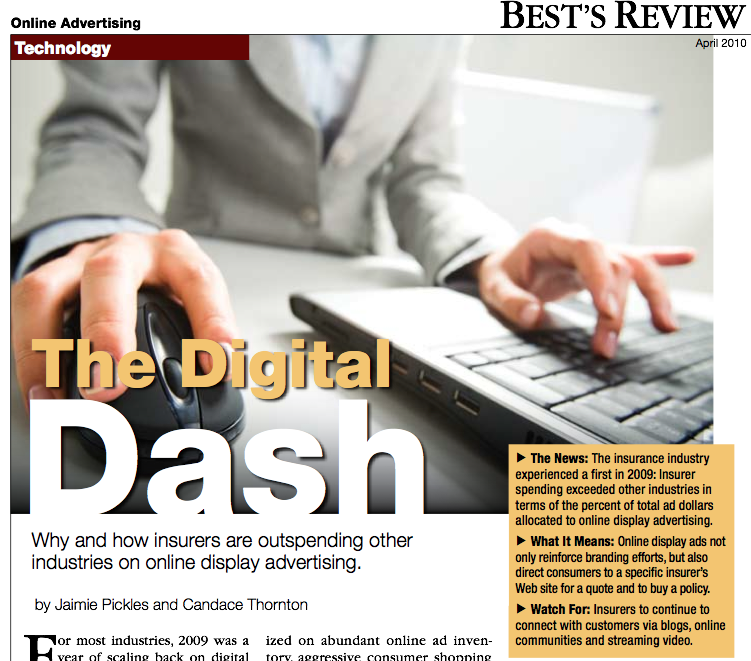 Jaimie Pickles and Candace Thornton have updated the digital ad spend by insurance carriers to include 2009 activity. The data and insights have been published in the April 2010 issue of Best's Review. If you want to know how much personal lines P/C insurers spent on digital advertising last year, download the article by clicking on the link directly below. Best's Review rarely publishes two-part articles. When Lynna Goch, editor of Best's Review, received an article submission from Jaimie Pickles and Candace Thornton on online advertising, she had several reactions. First, it was much too long. Second, it was much too important not to publish. So, the article was approved and appears in Best's Review's April and May 2009 editions. The article provides new data on online insurance consumer volume and demographics. Further, the article breaks new ground in laying out how much insurance companies are spending to advertise online in search, online leads, display, online-video and social media marketing. Can you guess the total amount spent in 2008? It's big! And it will be even bigger in 2009. Click on the links below to download the Best's Review articles. NEW YORK, Aug. 14, 2015 /PRNewswire/ -- Inc. magazine today ranked Fraud Posse No. 196 on its 34th annual Inc. 5000, an exclusive ranking of the nation's fastest-growing private companies. The list represents the most comprehensive look at the most important segment of the economy—America's independent entrepreneurs. Companies such as Yelp, Pandora, Timberland, Dell, Domino's Pizza, LinkedIn, Zillow, and many other well-known names gained early exposure as members of the Inc. 5000. "We have seen an unprecedented explosion in the digital media space that has also impacted the demand for our services," said Dave Stafford, CEO of Fraud Posse. "This ranking is an honor and speaks to the fact that we are protecting more companies from fraud today than ever before." As technology evolves, companies have greater opportunity to connect with consumers, but this also opens the door for unscrupulous lead generation ad practices. Fraud Posse was born out of a need to protect Stafford's own business when he experienced click-to-call fraud firsthand in the insurance industry. Fraud Posse, the only proactive compliance and rules enforcement platform for calls, detects fraudulent advertising in the mobile click-to-call ad space. Fraud Posse monitors and scores publisher performance to ensure quality lead generation. The patent-pending technology also ensures that publishers are not bidding on prohibited keywords or using prohibited language in their click-to-call mobile search campaigns. The audio and digital versions of A.M Best's E-Fusion Webinar series has been posted. Listen in as Jaimie Pickles, President of Canal Partner LLC, John Pogos, Vice President of E-Commerce for Aon Corp., and Brian S. Ocheltree, SVP of Business Development for DoublePositive Marketing Group Inc. present their views on the existing state and future expectations of online insurance. Judges for the 2008 E-Fusion Award are: Jaimie Pickles, President at Canal Partner LLC; Patricia Saporito, Service Line Leader, Insurance & Healthcare at Business Objects, a SAP Company; Michael T. Wise, VP Insurance Technologies at IdeaStar Inc. This year's E-Fusion finalists are: American Family Insurance, Progressive and Allied North America. E-Fusion Podcast Features Interview with Jaimie Pickles and Brian Ocheltree on Developments in Insurance E-Commerce. If you are interested in Canal Partner's research and/or how its clients can help your company, please see our Contact Jaimie Pickles page for complete contact information.